Memorial Day is Monday. Coincidentally, it was also the date of the next game waiting on the calendar in MLB 10: The Show when reader MSUHitman returned to the game this week after an eight-month hiatus spent playing Mass Effect, Dragon Age and other games. 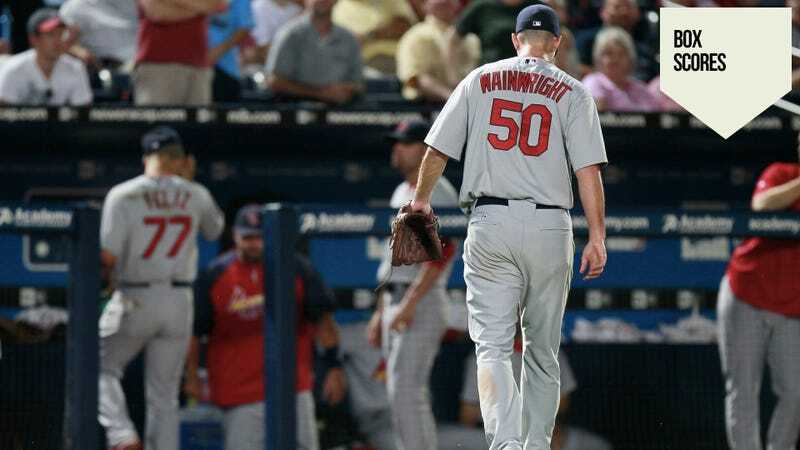 When he resumed his franchise with the St. Louis Cardinals, MSUHitman had a start with Adam Wainwright. Playing on All-Star difficulty, he'd struggled with that particular hurler, unable to get his curve over for strikes. Nonetheless, the Cardinals were in first place when the Reds came to town. The long layoff may have helped, as Wainwright's breaking ball was pinpoint effective from the early innings, with the fastball darting to locations where the Cincinnati batters couldn't get solid contact. Matt Holliday made a sliding catch of a sinking liner in the third inning. David Freese, Colby Rasmus and Brendon Ryan supplied superb fielding plays of their own in the middle innings, and soon it hit MSUHitman: he was two innings away from a perfect game. He'd done this only once before in video games, on April 2, 2007 with MLB 2K7 (he has the 100-gamerscore achievement to prove it). In the ninth, Wainwright got Brandon Phillips on a popout and MSUHitman readied a cell phone camera to record the magic moment. That was as good as a jinx. Chris Dickerson failed at a bunt attempt and then bombed a two-strike, low-and-inside slider over the right field wall for a game-tying home run. MSUHitman managed to collect himself, realizing the game was knotted 1-1, striking out Joey Votto with Drew Stubbs on second base to keep the game tied. In the 11th inning, he gutted out the victory when Skip Schumaker doubled and Ryan slapped a seeing-eye single through the right side of the infield. It's not a perfect game or a no-hitter or even a shutout, but considering the effort and the day, it's our Game of the Week. Here's the Box Score. Remember, all you have to do to get yourself featured in Box Scores' Game of the Week is take a picture of whatever sports video game been playing - crappy cell picture will do - write up a couple sentences about why it was so compelling, and email it to me, owenATkotakuDOTcom, with "Box Scores" in the subject header. I will star all submitters regardless of whether they are published. So be sure to include include your commenter page URL so I can properly credit the entry. Fox carries Barcelona vs. Manchester United in the UEFA Champions League championship match from London, 2 p.m. It's noon tomorrow on ABC. Forgot to point this out earlier. Memorial Day weekend always means baseball. Today, it's the White Sox at Toronto, 1 p.m.; Fox's game of the week is at 7, either the Phillies at Mets, Red Sox at Tigers, Reds at Braves, Angels at Twins, Royals at Rangers or Cardinals at Rockies. Which is to say, nearly the entire goddamn schedule. Check local listings. Tomorrow, you've got Boston at Detroit on TBS, 1 p.m.; the Pirates at Cubs on WGN, 2:10, and Cincinnati at Atlanta on ESPN2 at 8. UFC 130 is tonight; the preliminaries are on Spike at 8 p.m. At 9 on pay-per-view, Rampage Jackson and Matt Hamill beat on each other. The Coca-Cola 600, from Charlotte Motor Speedway, runs at 5:30 p.m. on Fox. There is a shitload of NCAA baseball, softball and lacrosse on ESPN2 and Fox Sports Net, check local listings. Golf's Byron Nelson Championship has its third and final rounds on CBS at 3 p.m. today and tomorrow. The French Open is on a same-day tape at noon today and tomorrow, NBC. Remember, you may send your sports Game of the Week nominations to owenATkotakuDOTcom, and flag it "Box Scores" in the subject header. Please include your commenter handle for proper credit.